The Indian government, from time to time, has adopted various licensing regimes with a view to enhance domestic production. As a general principle, an acreage awarded under a licensing regime continues to be regulated under such a regime, and any subsequently amended regime is applicable to acreages awarded under such regime. Therefore, at present different blocks are governed by different licensing regimes (depending on when they were awarded). The four broad categories of licensing regime that are presently applicable are discussed below. Under this regime, the petroleum exploration licence (PEL) was granted to the two national oil companies – Oil India Limited (OIL) and Oil and Natural Gas Corporation Limited (ONGC) on a nomination basis. Blocks were awarded to companies (including private and foreign companies) through an international competitive bidding process. The NELP regime was based on the 'production sharing model' (i.e., the Indian government is paid a part of the profits, after deducting the costs incurred by the contractor). The percentage of profit proposed to be paid by the contract was a biddable criteria. In contrast to the NELP regime, under which the contractor shared profits with the Indian government after recovery of costs, under the HELP regime, a revenue sharing model has been proposed (i.e., the contractor will share revenue with the Indian government). It is expected that this will reduce the Indian government's oversight over the day-to-day operations and the delay owing to scrutiny by the Indian government of costs incurred by the contractors. The first bidding round under HELP was launched in 2017 wherein 55 blocks were bidded out. Despite these aforementioned efforts of the Indian government, low levels of domestic production and failure to attract investments from foreign players are some of the key issues currently plaguing the sector. HELP, introduced in 2016, seeks to address some of these gaps. However, its effectiveness is yet to be seen. India has a federal constitution, where legislative powers are distributed between the central and the state legislatures.18 Pursuant to Article 246 of the Constitution of India, the regulation and development of oil fields, mineral oil resources, petroleum and petroleum products falls within the jurisdiction of the Union Parliament, that is, the federal legislative body of India. The state governments, on the other hand, have the power to regulate matters such as right of use and access land, labour, water and local government. Accordingly, while the contract for exploration and production of hydrocarbons is executed by the Indian government, the licences and approvals for undertaking activities relating to exploration and production for onshore blocks are to be obtained from state governments. For the offshore blocks, the Indian government has the licensing powers. the Petroleum and Natural Gas (Safety in Offshore Operations) Rules, 2008 (the PNG Safety Rules): The PNG Safety Rules have been framed under the Oilfields Act and prescribe safety standards and measures to be taken for the safety of offshore oil and gas operations. The PNG Safety Rules provide for the manner of preparation of information and records; various consents and intimations in relation to the offshore installations; safety, health and environment measures, etc., and prescribe the penalties for contravention of the PNG Safety Rules. Apart from the above legislation, the Indian government, from time to time promulgates policies, standards, directives and guidelines for governing various aspects of the upstream oil and gas sector (which amongst others include policies for the award of concessions for exploration of blocks and contractual structure to be followed). the Petroleum and Natural Gas Regulatory Board (PNGRB): This is the regulator for the midstream and downstream sector and has been empowered to regulate the refining, storage, transportation, distribution, marketing and sale of petroleum, petroleum products and natural gas. Therefore, transportation and evacuation of petroleum by pipelines outside the delivery point is subject to the PNGRB's oversight and regulations with respect to, among others, tariffs and technical safety standards. 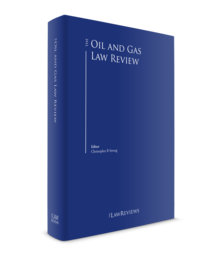 In addition to the above, there are other general regulatory and administrative bodies looking into matters such as the environment, labour and tax that may be relevant for a company operating in the oil and gas sector in India. India is a signatory to the Convention on the Recognition and Enforcement of Foreign Arbitral Awards, 1958 (the New York Convention) as well as the Geneva Convention on the Execution of Foreign Arbitral Awards, 1927. If a party receives a binding award from a country that is a signatory to either of the conventions, and is notified as a convention country by India, the award would then be enforceable in India subject to the satisfaction of the Indian courts of the enforceability of such awards. For enforcement of a foreign award, under either of the aforementioned conventions, the enforcing party has to fulfil certain requirements prescribed under the (Indian) Arbitration and Conciliation Act, 1996, such as production of arbitration award, etc. As noted under Section I, the licensing regime can be broadly categorised under nomination, Pre-NELP, NELP and HELP regime. PSCs have been entered into with contractors under the NELP and Pre-NELP regimes, and revenue sharing contracts (RSCs) would be further entered into for blocks awarded under the HELP regime. There have been organised licensing rounds (competitive bidding) under the NELP and HELP regime. However, there is a difference between the two regimes regarding the manner in which acreages are determined. While under NELP, the blocks on offer were determined by the Indian government, under HELP, the Indian government has introduced the concept of open acreage policy wherein the companies can choose the blocks from the designated area which are subsequently put for bidding. As per the provisions of the PNG Rules, the Indian government may, by way of a special or general order, restrict the amount of oil or gas to be produced, by a lessee in the respective allotted field, in the interest of conservation of oil resources.36 Further, the terms of contract provides that until India becomes self-sufficient, oil and natural gas produced in India is to be sold within the domestic market in India. Therefore, the freedom to sell hydrocarbons is limited to sale in India and the same cannot be exported. The price at which the gas produced is to be sold has undergone various changes over the years, and pricing freedom, which is one of the key features of HELP, is a relatively new concept in the sector. A brief background of the gas pricing regime followed in India is as follows. Prior to November 2014, the gas pricing regime was broadly divided under two heads: (1) administered pricing mechanism (APM); and (2) Non-administered pricing mechanism (Non-APM). The APM regime covered the gas sold by state-owned oil and gas companies, from blocks which were given to them on nomination basis and under this mechanism, where the Indian government determined the price at which gas was to be sold. The Non-APM regime regulated the price of gas produced from the Pre-NELP blocks and NELP blocks. Under the Non-APM regime, the price of gas was to be determined based on the provisions of the PSC executed by the parties. Accordingly, the price of gas produced from the Pre-NELP blocks was determined by the Indian government, and the price of gas produced from NELP blocks was to be based on a formula approved by the Indian government. In October, 2014, in order to bring about uniformity in the gas pricing regime, the MoPNG notified the New Domestic Natural Gas Pricing Guidelines, 2014 (the Gas Pricing Guidelines), which took effect from 1 November 2014. The Gas Pricing Guidelines prescribe a formula for determining the well head price of gas produced, and this price is notified on a half-yearly basis by the Petroleum Planning and Analysis Cell (PPAC). The price determined in accordance with the Gas Pricing Guidelines was applicable to all gas produced in India, (including gas from Nominated Blocks, Pre-NELP blocks, NELP blocks and CBM blocks), except in specified circumstances. In March 2016, the Indian government notified the Marketing including Pricing Freedom for the Gas to be produced from Discoveries in Deepwater, Ultra Deepwater and High Pressure-High Temperature Areas Guidelines, allowing pricing freedom for all discoveries in deepwater, ultra-deep water and high temperature-high pressure areas, which were yet to commence production as on 1 January 2016. Pursuant to these guidelines, the parties could sell gas at a price up to the ceiling price notified by PPAC on a half-yearly basis. In March 2016, by introduction of HELP, contractors have marketing and pricing freedom with respect to all hydrocarbons produced. It may be noted that the HELP regime is applicable prospectively to the blocks allocated under HELP, and not to the blocks that were awarded prior to enforcement of HELP. Accordingly, unless otherwise notified, the Gas Pricing Guidelines, the Deep Water, Ultra Deep Water, High Pressure-High Temperature Area Guidelines, and the CBM Pricing Guidelines, will continue to be applicable to blocks awarded or nominated prior to enforcement of HELP. Non-residents engaged in the business of supplying plant, machinery, facilities or services in connection with prospecting or extraction of mineral oils are subject to a presumptive tax regime, wherein taxable profits are deemed to be 10 per cent (plus surcharge and education cess) of the gross revenues. Hence, oil and gas companies are to deal with the parallel system of taxation. While they incur GST charges on services and charges used for operations, they cannot offset this against value added tax and excise duty on output such as crude oil, diesel etc. resulting in stranded taxes. Various special allowances and incentives are applicable to companies engaged in the Indian oil and gas sector. Foreign companies are exempt from tax on income earned from sale of crude oil to any consumer in India or storage of crude oil in any facility in India and its sale to any consumer in India. The conditions for the aforementioned are that (1) the income is earned in Indian currency; (2) the agreement for such sale and the foreign company are approved and notified by the central government; and (3) the foreign company does not have any other activity in India. The environmental approvals and permissions that are required to undertake oil and gas operations in India include general environmental approvals as provided under the environmental legislations and specific approvals based on the location of the oilfield. authorisation for handling hazardous waste: Under the Hazardous Wastes (Management, Handling and Trans-boundary Movement) Rules 2016, authorisation from the state pollution control board is required for generating, processing, treating, packaging, storing and transporting waste (generated from drilling for oil and gas). wildlife clearance: If the exploration and production activities are planned in and around protected areas such as national parks and wildlife sanctuaries, in addition to the environmental clearance and forest clearance, clearance under the Wildlife (Protection) Act, 1972 is also required. Apart from the obligation contained under the environment laws, the PSCs and RSCs also provide for certain additional obligations in relation to protection of the environment. The terms of the contracts stipulate that the contractor shall conduct the petroleum operations with due regard to environmental protection concerns. In this regard, the contractors are required to adopt modern oilfield and petroleum industry practices and standards (under the terms of PSC) or good international petroleum industry practices and standards (under the terms of RSC) including advanced technologies, practices and methods of operations for the prevention of environmental damage. The relevant clause further provides that in the event of an emergency, such as accident, oil spill and fire, the contractor shall implement relevant contingency plan and perform such site restoration as may be necessary. As per the Foreign Direct Investment Policy (FDI Policy), read with The Foreign Exchange Management Act, 1999 (FEMA) and the Foreign Exchange Management (Transfer or Issue of a Security by a Person Resident Outside India) Regulations, 2017, 100 per cent foreign direct investment (FDI) is permissible under the 'automatic route' (i.e., without the approval of the Indian government for exploration and production in oil and gas fields).53 Accordingly, a foreign company can undertake operations in the oil and gas sector either by itself or as a consortium with an Indian partner. A foreign company can undertake exploration and production activities in India without incorporating a company in India. Most foreign companies operating in this sector have setup a project office. The setting up of a project office is regulated under the Foreign Exchange Management (Establishment in India of a branch office or a liaison office or a project office or any other place of business) Regulations, 2016, as may be amended from time to time. As discussed above, 100 per cent FDI is permitted under the FDI per the provisions of FEMA, certain restrictions can be placed on the transactions based on their classification as current account transactions and capital account transactions.54 Current account transactions are permissible unless specifically restricted by the Indian government and all capital account transactions are specifically prohibited unless specifically permitted by the Indian government. With respect to local content and employment to Indian citizens, the PSCs and RSCs provide that: (1) the contractor shall, to the maximum extent possible, employ (and require the operator and its subcontractors to employ) Indian citizens having appropriate qualifications and experience; and (2) give preference to the purchase and use of goods (equipment, materials and supplies) that are manufactured, produced or supplied in India subject to their timing of delivery, quality and quantity required, price and other terms. The Prevention of Corruption Act, 1988 (PoCA) is the primary legislation for prevention of corruption in India. As per the recent amendment of July 2018 to PoCA, commercial organisations including companies that are either incorporated or undertaking business in India can be specifically charged as bribe givers and are punishable with fine.55 The Central Vigilance Commission (CVC) is the apex vigilance institution and is free from any executive control. The CVC, pursuant to the mandate granted to it under the Central Vigilance Commission Act, 2003, can conduct inquiries into allegations of offences committed under the PoCA by certain categories of public servants, government companies, societies and local authorities etc. The Black Money (Undisclosed Foreign Income and Assets) and Imposition of Tax Act, 2015 regulates the undisclosed foreign income and assets and imposes penal taxes on undisclosed foreign income and assets. Additional criminal liabilities have also been included under the legislation for non-disclosure of foreign assets and wilful attempts to evade taxes. The Prevention of Money-laundering Act, 2002 (PML Act) and the Prevention of Money-Laundering (Maintenance of Records) Rules, 2005 prohibit and criminalise money laundering activities in India. Under the PML Act, 'money laundering' is defined as any process or activity connected with the proceeds of a crime listed in the schedule to the PML Act, and projecting or claiming it as untainted property.56 In order to prevent money laundering activities, the PML Act requires all banks, financial institutions, and persons engaged in certain designated activities, to maintain records of all transactions undertaken. An operator of an upstream oil and gas block does not qualify as a reporting entity under the PML Act and the PML Rules. The Companies Act, 2013 also contains provisions with respect to statutory audits, corporate governance requirements, annual filing requirements among others that, inter alia, seek to prevent fraud and instances of money laundering. Further, pursuant to Section 216 of the Companies Act, 2013, the Indian government has the power to initiate investigation to find out the real beneficiary of a financial transaction undertaken by a company. Some of the current developments in the sector are as follows. The Indian government has been focusing on the implementation of the HELP regime. Under HELP, 55 blocks were offered on a competitive bidding basis under OALP Bid Round-1. Out of the 55 blocks, 41 blocks have been awarded to Vedanta Limited, nine blocks to OIL, two blocks to ONGC and one block each to Bharat PetroResources Limited, Hindustan Oil Exploration Company Limited and GAIL Limited.57 No foreign player had submitted its bid for this round. 1 Venkatesh Raman Prasad is a partner at J Sagar Associates. 2 BP Statistical Review of World Energy, (June 2018, 67th ed. ), page 8, available at https://www.bp.com/content/dam/bp/en/corporate/pdf/energy-economics/statistical-review/bp-stats-review-2018-full-report.pdf. 3 Energy Statistics (2018), Ministry of Statistics and Programme Implementation, Government of India, page 41, available at www.mospi.gov.in/sites/default/files/publication_reports/Energy_Statistics_2018.pdf. 4 Annual Report 2017-18, Ministry of Petroleum and Natural Gas, Government of India, page 30, available at http://petroleum.nic.in/sites/default/files/APR_E_1718.pdf (MoPNG Annual Report). 5 India's Hydrocarbon Outlook: 2016-17, Directorate General of Hydrocarbons, Ministry of Petroleum and Natural Gas, Government of India, page 24, available at www.dghindia.gov.in/assets/downloads/ar/2016-17.pdf (DGH Report). 6 MoPNG Annual Report, Page 26. 7 'Blocks Awarded for Exploration & production', http://petroleum.nic.in/sites/default/files/blocksawarded.pdf. 8 DGH Report, page 27. 9 DGH Report, page 27. 10 New Exploration Licensing Policy, Resolution No. N-O-19018/22/95-ONG-DO-VI, 10 February 1999, Ministry of Petroleum & Natural Gas, Government of India, http://petroleum.nic.in/sites/default/files/circulars-notifications60.pdf. 11 DGH Report, pages 24–25. 12 Under the profit sharing model, the management committee (which includes the Indian government representatives) scrutinise cost details of private participants. This process has led to many delays and disputes in the past. 13 Hydrocarbon Exploration and Licensing Policy, Resolution No. O-32011/4/2013-ONG-I, 30 March 2016, Ministry of Petroleum & Natural Gas, Government of India, http://petroleum.nic.in/sites/default/files/HELP.pdf. 14 'Marginal field policy', Resolution No. O- 19018/22-95-ONG.III, Press Information Bureau, Government of India, Ministry of Petroleum and Natural Gas (15 October 2015, 05:20 PM), http://pib.nic.in/newsite/printrelease.aspx?relid=128772. 15 'CBM Policy approved by the Government on the 19th July, 1997', http://petroleum.nic.in/sites/default/files/cbmpolicy_0.pdf. 16 'Shale Oil and Gas', Directorate General of Hydrocarbons, Ministry of Petroleum & Natural Gas, Government of India, http://www.dghindia.org/index.php/page?pageId=37. 17 'Cabinet approves Policy Framework for exploration and exploitation of Unconventional Hydrocarbons', Press Information Bureau, Government of India, Cabinet, (1 August 2018, 06:10 PM), http://pib.nic.in/newsite/PrintRelease.aspx?relid=181361. 18 INDIA CONST., Article 246 r/w Entry 53, List I of Schedule VII. 19 The Oilfields (Regulation and Development) Act, 1948, No. 53, Acts of Parliament, 1948 (India). 20 Oilfields Act, Sections 5 and 6. 21 Oilfields Act, Section 6A(1). 22 PNG Rules, Rule 4. 23 Directorate General of Hydrocarbons, Website/ About DGH, http://dghindia.gov.in. 24 Notification No. SO 1502(E), Ministry of Petroleum and Natural Gas, Government of India (8 June 2008). 25 Ad hoc arbitration is arbitration agreed to and arranged by the parties themselves without recourse to any institution. 26 India, Investment policy hub, http://investmentpolicyhub.unctad.org/IIA/CountryBits/96. 27 'Model Text for the Indian Bilateral Investment Treaty', Press Information Bureau, Government of India, Cabinet, (16 December 2015, 08:10 PM), http://pib.nic.in/newsite/PrintRelease.aspx?relid=133411. 28 The exact date of termination of the aforementioned 58 BITs is not clear as no official statement has been issued by the GoI in that regard. However, as per the information available in public domain, the BITs were terminated on 31 March 2017, 'India to trade partners: Sign new bilateral investment treaties by 31 March', https://www.thehindubusinessline.com/economy/indias-bilateral-investment-pacts-under-cloud/article9625580.ece. 29 Joint Interpretative Notes on the Agreement between the Government of the Republic of India and the Government of the People's Republic of Bangladesh for the Promotion and Protection of Investments, https://dea.gov.in/sites/default/files/Signed%20Copy%20of%20JIN.pdf; 'Cabinet approves Joint Interpretative Declaration between India and Colombia regarding the Agreement for the Promotion and Protection of Investments signed on November 10, 2009', Press Information Bureau, Government of India, Ministry of Finance, (10 November 2017, 06:05 PM), http://pib.nic.in/newsite/PrintRelease.aspx?relid=173391. 30 Investment policy hub, http://investmentpolicyhub.unctad.org/ISDS/FilterByCountry. 31 'India and Mauritius sign the Protocol for amendment of the Convention for the Avoidance of Double Taxation and the Prevention of Fiscal Evasion with respect to Taxes on Income and Capital Gains', Press Information Bureau, Government of India, Ministry of finance, (10 May 2016, 06:12 PM), http://pib.nic.in/newsite/PrintRelease.aspx?relid=145185; 'India and Singapore Sign a Third Protocol for Amending the Double Taxation Avoidance Agreement (DTAA)', Press Information Bureau, Government of India, Ministry of finance (30 December 2016, 06:10 PM), http://pib.nic.in/newsite/PrintRelease.aspx?relid=156015. 32 PNG Rules, Rule 7(i). 33 PNG Rules, Rule 7(ii). 34 PNG Rules, Rule 5. 35 Territorial Waters, Continental Shelf, Exclusive Economic Zone and Other Maritime Zones Act, 1976, No. 80, Acts of Parliament, 1976, Section 6(4), Section 7(5). 36 PNG Rules, Rule 27. 37 PNG Rules, Rule 17. 38 Model RSC, Ministry of Petroleum and Natural Gas (2017), Article 26.3. 39 Richa Mishra, 'What kept foreign players off OALP-I', Business Line, May 7, 2018, available at https://www.thehindubusinessline.com/economy/what-kept-foreign-players-off-oalp-1/article23805274.ece. 40 The Petroleum Tax Guide, Ministry of Petroleum & Natural Gas-Government of India, https://www.ndrdgh.gov.in/NDR/pdf/PETROLEUM_TAX_GUIDE.pdf. 42 Richa Mishra & Twesh Mishra, 'GST: Fitment blues worry oil and gas industry', The Hindu Business Line (11 June 2017) www.thehindubusinessline.com/economy/policy/gst-oil-and-gas-industry/article9724778.ece. 43 'GST credit will be available only on value-added crude oil products', The Hindu Business Line (21 August 2017), www.thehindubusinessline.com/economy/gst-credit-will-be-available-only-on-valueadded-crude-oil-products/article9825371.ece. 44 Section 42 of the IT Act. 45 Section 35AD of the IT Act. 46 Section 32(iia) of the IT Act. 47 PNG Rules, Rule 22(1). 48 PNG Rules, Rule 22(2). 49 PNG Rules, Rule 22(3). 50 Model PSC, NELP-IX, Ministry of Petroleum and Natural Gas (2010), Article 14.10; Model RSC, Ministry of Petroleum and Natural Gas (2017), Article 14.8. 51 Model RSC, Ministry of Petroleum and Natural Gas (2017), Article 4.4. 52 Site Restoration and Abandonment Guidelines for Petroleum Operations (April 2018). 53 'Consolidated FDI Policy (effective from 28 August 2017)', D/o IPP F. No. 5(1)/2017-FC-1, Department of Industrial Policy and Promotion Ministry of Commerce and Industry, Government of India. 54 As per the FEMA, 'Capital account transaction' means a transaction which alters the assets or liabilities, including contingent liabilities, outside India of persons resident in India or assets or liabilities in India of persons resident outside India, and includes transactions referred to under the provisions of FEMA; and 'current account transaction' means a transaction other than a capital account transaction and without prejudice to the generality of the foregoing such transaction includes: (1) payments due in connection with foreign trade, other current business, services, and short-term banking and credit facilities in the ordinary course of business; (2) payments due as interest on loans and as net income from investments; (3) remittances for living expenses of parents, spouse and children residing abroad; and (4) expenses in connection with foreign travel, education and medical care of parents, spouse and children. 55 The Prevention of Corruption (Amendment) Act, 2018, No. 16 of 2018 (26 July 2018). 56 Section 3 of the PML Act. 58 'Discovered Small Fields', official website, http://online.dghindia.org/dsf2/. 59 'Cabinet approves Policy Framework for exploration and exploitation of Unconventional Hydrocarbons', Press Information Bureau, Government of India, Cabinet (1 August 2018, 06:10 PM), http://pib.nic.in/newsite/PrintRelease.aspx?relid=181361. 60 'Cabinet approves Policy framework for streamlining the working of Production Sharing Contracts (PSCs) in Pre-NELP and NELP Blocks', Press Information Bureau, Government of India, Ministry of Petroleum & Natural Gas, (18 July 2018, 05:14 PM), www.pib.nic.in/Pressreleaseshare.aspx?PRID=1539026. 61 'Reliance Industries wins international award in gas row with govt', Times of India, (1 August 2018, 9: 18 AM), https://timesofindia.indiatimes.com/business/india-business/ril-wins-intl-award-in-gas-row-with-govt/articleshow/65221285.cms. In our seventh year of writing and publishing The Energy Regulation and Markets Review, we have seen dramatic changes in global energy policies.